LOVE is mall around in the run up to Valentine’s Day and Braehead Shopping Centre is offering a prize for the best romantic story. The team that runs one of Scotland’s biggest malls wants to hear from shoppers who have a romantic tale to tell. And the person with the story that tugs at the heartstrings the most will win a £100 Braehead gift card, bouquet of roses, bottle of champagne and luxury chocolates. Braehead’s marketing manager, Lydia Brown, explains: “We want to hear about people’s romantic stories – the kind of stories that warms the heart and makes you say …awwh! “The stories could be about anything from how someone proposed in a really romantic way, to how a couple met in unusual circumstances, how love blossomed, or how someone shows their love in a special way. “We’ll feature the best romantic tales on our website and the person with the best story we receive will win the £100 Braehead gift card, champers, roses and chocolates. 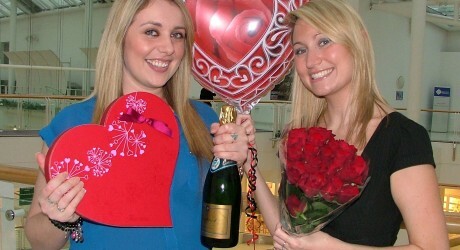 Anyone with a romantic tale to tell should log on to www.braehead.co.uk and follow the link. MEDIA RELEASE posted by Macdonald Media. You too can post media releases (aka press releases) on allmediascotland.com. For more information, email here.